HomeAll PostsContentHow-to/What isFlash Bulbs – The Lowdown! Flash Bulbs - The Lowdown! Editor's Notes: Millions of vintage cameras (especially the Kodak Instamatic cameras here in the US) use flash bulbs. Most cameras that use flash bulbs have the bulb number needed listed inside the camera. If not, head over to the Mike Butkus Camera Manual Site and pick up a camera manual. The flashbulb was developed to provide a safer alternative to the flashpowder used to create artificial light for photographs, especially when used indoors. The first comercially available flashbulb was the Vacu-blitz, made in 1929 by Hauff-Leonar AG of Germany. This was a glass bulb about the size of an ordinary light bulb and was filled with ultrathin aluminum foil in a low pressure oxygen atmosphere. The foil was ignited using electricity. General Electric (GE) and Westinghouse aquired the license rights to the bulb design and began marketing them in the US. Figure 1 shows examples of flashbulbs available today. All flashbulbs are conceptually the same. All consist of a glass bulb containing a thin filament or foil made of aluminum, magnesium or zirconium. The bulb is filled with pure oxygen at low pressure. Two electrodes are connected to the filament or foil to pass electricity through it and the bulb is sealed to a base which is electrically connected to the electrodes. The most common base for large bulbs was the screw base used today on ordinary light bulbs, the Edison E27 Screw, also known as the Mazda base. Other types used on smaller bulbs are the bayonet and the smaller flanged base. The smallest bulbs dispensed with the base altogether, running the electrode contacts out through the glass at the bottom of the bulb. Figure 2 shows each of the bases mentioned. Since the bulbs are incandescent, flashbulbs meant for color photography are colored blue to correct for daylight film. There are also infrared bulbs for use with infrared film. All bulbs are also coated with laquer or plastic to hold them together in case the glass cracks due to the heat. Unlike electronic flashes, all flashbulbs are on-time use. All flashbulbs create a lot of heat when fired, so some safety precautions are necessary to avoid burning your fingers when installing and removing them from the flashgun. The bulbs can be set off by static electricity, so carrying loose bulbs in your pocket is discouraged. Although bulbs can crack when fired, they seldom explode, but it does happen, so a shield should be used over the reflector, especially indoors or when shooting close to a person. The bulbs most likely to explode are those where the seal at the base has failed and air has been sucked into the bulb. This raises the initial gas pressure in the bulb, and when fired, the sudden expansion of the gas due to the heat can raise the pressure above the bulb's burst pressure, causing it to shatter. To identify the problem, manufacturers began to put a spot of blue cobalt ("blue dot") inside the bulb which will turn pink when exposed to air. Bulbs whose dots are pink should not be used. Incidentally, the largest flashbulb ever produced was the GE/Mazda #75. It was approxiamately 8 inches long and over 4 inches in diameter and looked like a huge lightbulb stuffed full of aluminum foil. It was a non-synchronized bulb (which means you had to shoot the old fashioned way with the shutter set on B) and was manufactured during World War II for aerial photography at night. The first flashbulbs manufactured in the US were made by GE starting in 1930. Flashbulbs in the US were produced in large quantities by many manufacturers. As the decades wore on and the electronic flash became more popular, more and more manufacturers quit producing flashbulbs. Sadly, only one manufacturer of flashbulbs exists in 2018, Meggaflash of Ireland. They make only 3 bulbs - two large bulbs for still photography and one long duration bulb for high speed movie photography. The good news is there are still many flashbulbs available for sale at flea markets, auction sites and dealers on the internet. 1) Power. For all but the smallest bulbs, the lighting power of a flash bulbs exceeds all handheld electronic flashes available today. The large bulbs, such as the GE#22, are especially coveted by spelunkers who want to photograph the cave they are exploring, and since some caves are immense, electronic flashes are insufficient. 2) The camera. Many of the old Kodak Brownies will only work with flashbulbs. Also Kodak Instamatics and some Polaroids use flashcubes or Magicubes. Unless you are talented at modifying cameras to change the synch delay (more about that later) or flash fittings, using flashbulbs is a must. 3) The quality of light. Some photographers, especially those shooting color, consider the light from a flashbulb to have a superior quality. The light is less harsh than from an electronic flash and yields warmer, richer colors. 4) To solve particular problems or special effects. If you are taking a portrait on a sunny day with a camera that has a focal plane shutter with a slow synch speed, using an FP flashbulb for the fill-in flash can allow you to use a higher shutter speed. Also, the long burn time of a bulb combined with a slow shutter speed can create images that show motion, something hard to do with an electronic flash. Flashbulbs are described by class, such as F (fast peak), S (slow peak), M (medium peak) or FP (most people call these "Focal Plane", but really means "flat peak"). These classifications refer to their burn characteristics and the time it takes to reach peak brightness. Some of these classifications are for specialty bulbs needed for specific applications, so we will limit this discussion to the two classes used most by photographers, M and FP. When buying flashbulbs, keep in mind there was no uniform method of identifying what type of bulb it is, so research is necessary to determine if it is the correct type for your camera and flashgun. Some bulbs, such as the GE Powermite M2, are not really M class bulbs and must be shot using X or FP synch at shutter speeds slower than 1/30 second. Fortunately, there is a lot of information on the internet regarding flashbulbs. 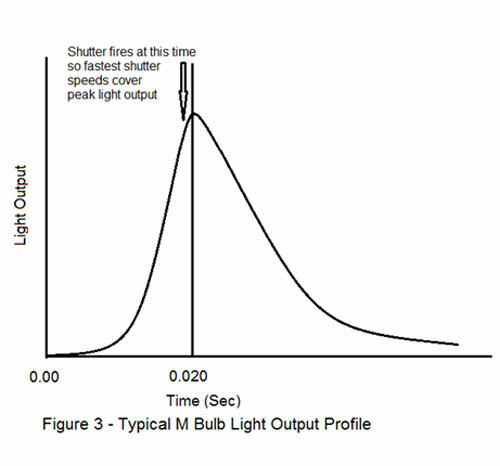 The typical light output as a function of time for an M class bulb is shown in Figure 3. M class bulbs are designed to reach peak brightness 20 milliseconds (0.020 seconds) after the bulb is fired. These bulbs are intended to be used with leaf shutters (they can be used with focal plane shutters but only at shutter speeds at 1/30 seconds or less). To use these bulbs at fast shutter speeds the bulb must be fired before the shutter opens fully. To make sure the open shutter at the fastest shutter speed (1/400 sec or 1/500 sec) covers the peak of the bulb light output, the bulb is fired 18 milliseconds before the shutter is fully open. This is referred to as the "M synch" (as opposed to the "X synch", which fires the flash at the instant the shutter is fully open). The Graphex shutter has two M settings, the normal one for fast shutter speeds, and another one with a shorter delay between bulb firing and shutter opening to get the most from the bulb burn at slower shutter speeds. The Kodak Supermatic and Synchro Rapid 800 have adjustable delays which you can change the delay based on the shutter speed. The following is a partial list of the M class bulbs available today. All are available in clear or blue. Blue bulbs have a "B" after its designation (i.e. GE #22B). All GE bulbs and most other bulbs will fire at 3 volts and above. GE #22 - This bulb is about the size of a 60 watt light bulb and has an Edison screw base. At ASA 100 and 1/60 second, clear bulbs have a guide number of 440, blue bulbs 280. Sylvania #2 - The Sylvania equivalent of the GE #22. GE #11 - Smaller than a GE #22, it is about 1 stop dimmer than a GE #22. Also has an Edison screw base. Sylvania Press 40 - Sylvania equivalent of the GE#11. GE #5 - This is much smaller than the GE#11 and has a large bayonet base that fits into the Graflex 5 inch reflector or the flash gun used with the Argus C3. It is about one-half stop dimmer than the GE #11. These bulbs are very common and easily found. Sylvania Press 25 - Sylvania equivalent to the GE#5. These are also easy to find. GE Powermite M5 - These are smaller than the GE #5 with a small flanged base, but put out the same amount of light. These bulbs fit into the Polaroid 268 flashgun. Still easy to get. GE and Sylvania M3 - Equivalent to the GE Powermite M5. These can also substitute as FP bulbs with some 35mm focal plane cameras. Very easy to find. AG-1 - These are small bulbs with no base, first sold in 1958. Made by mainly by GE and Sylvania, these are very easy to find. These bulbs are used in the Kodak Flashmite, Starmite, early Instamatics and some Minox cameras. 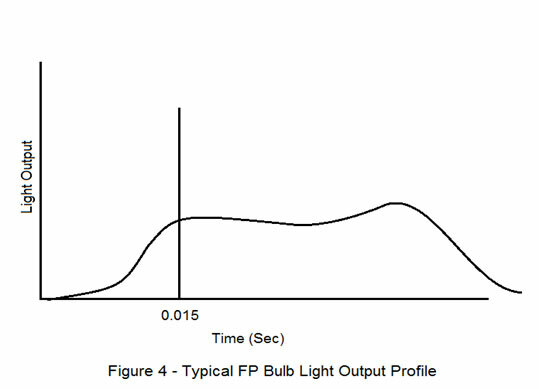 The typical light output as a function of time for an FP class bulb is shown in Figure 4. While M class bulbs have a light/time curve that rises quickly to its peak, then quickly dies off, FP bulbs reach peak brightness quicker (about 15 milliseconds) and burn longer at a constant intensity. This provides an even exposure as the curtains of a focal plane shutter move across the film. Their use requires a camera with an FP synch. FP synch has a shorter delay between the time the bulb fires and when the shutter is activated. The following is a partial list of the FP class bulbs available today. As with M bulbs, all are available in clear or blue. Blue bulbs have a "B" after its designation (i.e. GE #6B). All GE bulbs and most other bulbs will fire at 3 volts and above. GE #31 - This is a large bulb with an Edison base and is the bulb you want to use with the focal plane shutter on a 4x5 Speed Graphic (consult your owner's manual, there are restrictions). These bulbs have an total burn time of 90 milliseconds and remain at maximum light output for 50 milliseconds. With ASA 100 film and 1/500 second shutter speed, they have a guide number of 60 for clear bulbs, 50 for blue bulbs. These bulbs are hard to find. GE #6 - This bulb is similar in size to the GE #5 with the bayonet mount. Total burn time is about 60 milliseconds and remain at maximum output for about 25 milliseconds. GE recommends this bulb not be used with shutters larger than 2-1/4 x 3-1/4, so cannot be used with the 4x5 Speed Graphic, but could be used with the 2x3 Speed Graphic (at 1/1000 seconds only) and other medium format cameras. These bulbs are common and easy to obtain. Sylvania FP26 - The Sylvania equivalent to the GE#6. Not as numerous as the GE#6, but still easy to obtain. GE Powermite M5, GE and Sylvania M3 and AG-1 - Although technically, these bulbs are Class M bulbs, they have a flatter burn profile than the typical Class M bulb, so can be used in 35mm cameras with focal plane shutters and FP synch (but not medium format). Use at shutter speeds of 1/100 second or greater. Slower shutter speeds may yield uneven results. You will need to test your particular camera to see if these bulbs will work. The following bulbs are worth mentioning since you may come across them and they have some restictions. Sylvania #3 and GE #50 - These are the largest synchronized flashbulbs made. Each bulb is about 5 inches high and 2-1/2 inches in diameter, with the Sylvania slightly larger than the GE and about 10 percent brighter. These are Class S bulbs with a time-to-peak of 30 milliseconds. Therefore, they must be shot at shutter speeds of 1/30 seconds or slower. With ASA 100 film, the GE has a guide number of 560 when using a large studio reflector. That's a lot of light! These bulbs are much less numerous than the GE #22, but can still be found. Coveted by spelunkers. GE Powermite M2 and Sylvania M2 - These bulbs looks like the Powermite M5, but have a faster time-to-peak (15 milliseconds) than the M5. It also a shorter total burn time, so it must be shot using F or X synchronization at shutter speeds slower than 1/30 seconds. Still readily available. GE SM - This is a Class F about the size of a GE #5 with a bayonet base. It's time-to-peak is 5 milliseconds with a total burn time of 15 milliseconds. It can be shot at any speed with F synch, and shutter speeds slower than 1/125 seconds with X synch. It is about 1 stop dimmer than a GE #5. Not numerous, but still available. This completes my general overview of flashbulbs. There is a lot more information on the internet. If you have never used flashbulbs or fully explored their potential uses, get yourself a box or two and start experimenting. Steven Ringrose is an amateur photographer who has been shooting film since he received a Kodak Starmite II for Christmas in 1965. In 2015 he retired after 33 years as an engineer in the civilian Naval Nuclear Program. 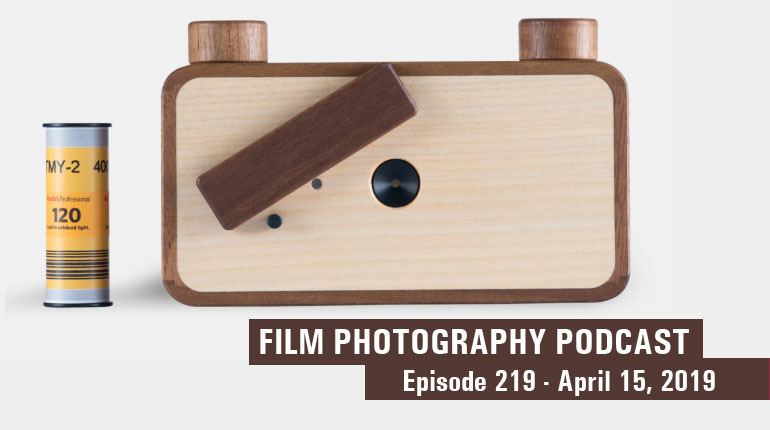 Since retirement he's become an avid fan of the FPP and have developed a love for Fujichrome 120 and Fuji Instax.